Legendary investor George Soros has warned of "serious consequences" for British jobs and finances if the country leaves the EU. Writing in the Guardian, he said sterling would "decline precipitously" if the Leave camp won Thursday's vote. Mr Soros made a fortune betting against the pound on Black Wednesday in 1992, when Britain left the ERM, and said Brexit would cause bigger disruption. Vote Leave said the UK would be more prosperous outside the EU. "The EU is costly, bureaucratic and blind to the impact it has had on people's wages and soaring energy bills," said Vote Leave chief executive Matthew Elliott, who accused Mr Soros of wanting to give more power to Brussels. Mr Soros said in his article that leaving the EU would see sterling fall by at least 15%, and possibly more than 20%, to below $1.15 from its current level of around $1.46. "The value of the pound would decline precipitously," he writes. "It would also have an immediate and dramatic impact on financial markets, investment, prices and jobs. "I would expect this devaluation to be bigger and also more disruptive than the 15% devaluation that occurred in September 1992, when I was fortunate enough to make a substantial profit for my hedge fund investors. "British voters are now grossly underestimating the true costs of Brexit. Too many believe that a vote to leave the EU will have no effect on their personal financial position. This is wishful thinking." 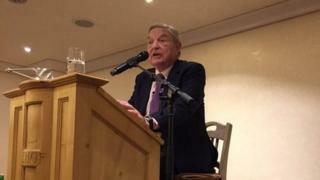 Justice secretary and Leave campaigner Michael Gove said Mr Soros had long been a strong supporter of deeper economic integration and had been wrong over the euro, believing it would be an "anchor of stability" for Europe. "The truth is that economic forecasters like George Soros have got things wrong in the past," he told Radio 4's Today. "They were the people who argued that we should join the single currency. The single currency has brought misery to the continent." Former chancellor Lord Norman Lamont also dismissed Mr Soros' warning. "The devaluation of sterling in September 1992 didn't do the UK economy any harm, far from it. Nor would a fall in the pound this time necessarily be a disaster. The key difference between now and 1992 is that today the pound is floating and any devaluation could be self-correcting and temporary," he said. Mr Soros warned that the Bank of England's ability to respond to a recession or fall in house prices was limited, with many monetary tools already having been used to steer the UK out of the global financial meltdown. Sixty years of investing experience had taught him that the only winners would be financial speculators, he said. Mr Soros writes: "Today, there are speculative forces in the markets much bigger and more powerful. And they will be eager to exploit any miscalculations by the British government or British voters,"
"Brexit would make some people very rich - but most voters considerably poorer," Mr Soros said. Sterling has already see-sawed in the run-up to the referendum as investors speculate on the likely outcome. Last week, the pound fell sharply after polls suggested the Leave camp was gaining ground. On Monday sterling saw its biggest daily gain since 2009 on fresh polls suggesting Remain had renewed momentum. In 1992, Mr Soros used his Quantum Fund investment vehicle to bet successfully that sterling was overvalued against the Deutsche Mark, forcing then-Prime Minister John Major to pull the pound out of the European Exchange Rate Mechanism. On Thursday evening and through the night, some of the world's biggest banks are expected to have senior traders working during what some people think could be the most volatile trading for sterling since Black Wednesday. Vote Leave hit back at claims that an EU-exit would mean a rise in the cost of living. "Independent experts are clear, EU membership and the meddling court that comes with it have put up prices and hurt our economic growth," Mr Elliott said. "If we Vote Leave, we can take back control of the £350m we hand to Brussels every week and spend it on our priorities." The claim and counter-claim from business and industry has intensified as the Referendum nears. Earlier this month Lord Bamford, chairman of JCB - one of Britain's most successful manufacturers - wrote to his company's 6,500 employees in the UK to explain why he favoured a vote to leave the European Union. And last week, entrepreneur Sir James Dyson told the Daily Telegraph Britain would gain more from leaving the EU than it would lose.